Sedums are fabulous perennials for any mixed border. The bees smother them in late summer, and during autumn the flower heads come into their own. I grow different varieties - some creamy white, some pink, and of course the famous 'Autumn Joy'. I also enjoy sedums with variegated foliage. I often grow them at the edge of a garden border, where I can enjoy the leaf colour and watch the colour changes. My Sedums Are a Flop! Some of the sedums in my garden always flop over. Yet I see pictures of them in perennial and grass gardens and they seem to stand perfectly upright. Hmm... Perhaps I can blame the wind, or the big whooshy irrigation, without which even the sedums in my garden would suffer. One year I'd really like to see these beautiful late perennials flowering properly. Maybe they just have too much room to move and breathe in my garden. Or not enough sun? Perish the thought - my summers are always sunny! 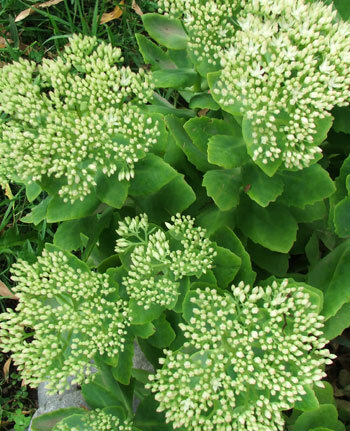 And I'd rather have sedum flowers that flop than no flowers at all. Though I have seen sedums used like box balls in a garden design, and moved out as soon as their flower heads started to form. Maybe this is a clever idea, but it seems to be quite a pity to only use half of a plant, if you know what I mean. Of course sedums are very easy to propagate, and just occasionally some of the varieties I grow are invaded by insects - usually aphids. 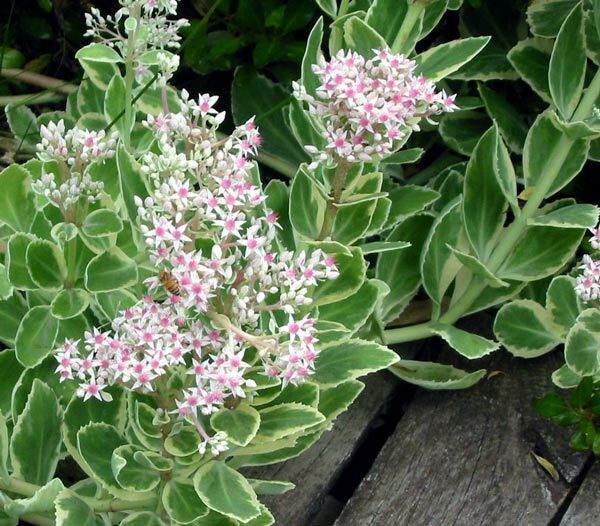 I grow two variegated varieties which seem particularly susceptible in autumn. Luckily it's usually about the time I'm doing the pre-winter cut and trim. 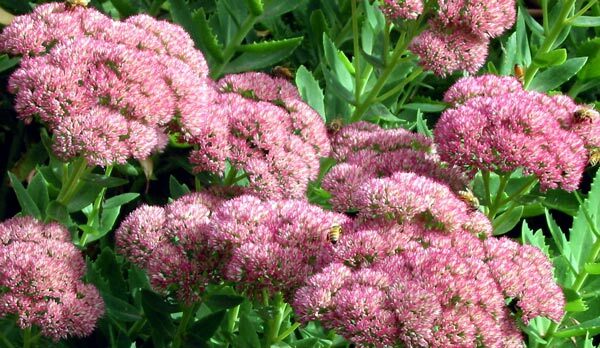 The variety of perennial sedum which is best known has the name 'Autumn Joy'. 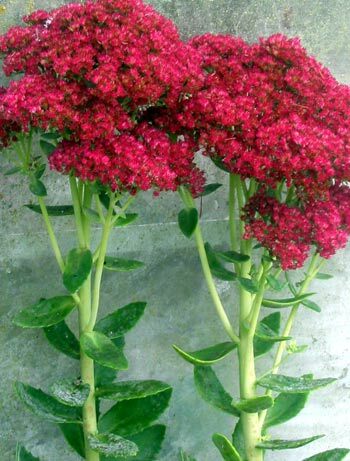 I have this sedum growing by the doorway of my glass house. The flower heads change colour throughout the season, ending up a rich burnt rusty brown. 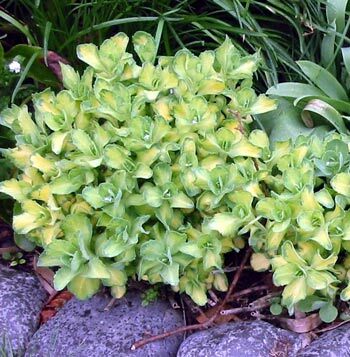 The leaf patterns of this particular sedum are very subtle in colour. But yet again it tends to flop and sprawl over the garden for me. My garden gets messy enough without my sedums contributing to the look! My variegated sedums definitely look their best in spring when their fresh new growth starts, before they flop (like the New Zealand cricket team) in the cricket season!